Since 1966, the Dixie National Rodeo in Jackson, Miss., has hosted some of the biggest names in ProRodeo and witnessed some fast times and high scores, as cowboys competed for this iconic rodeo’s large payout. Winning big at Jackson can set the pace for the rest of the year. It’s not unheard of for a cowboy to leave with more than $10,000. Steer wrestler J.W. 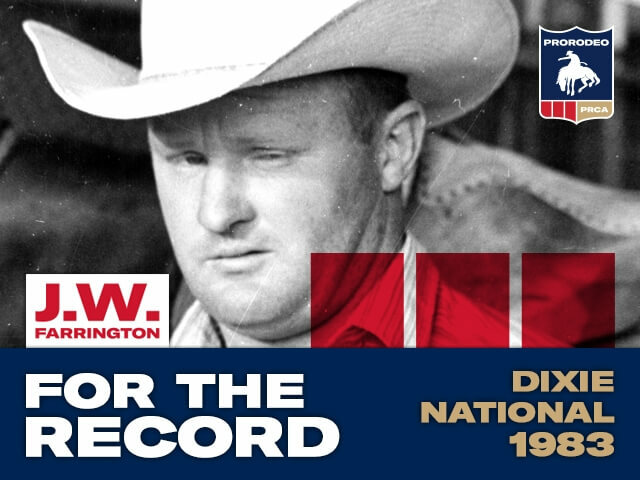 Farrington holds the longest-standing record at the Dixie National Rodeo with his 2.9-second run that he made in 1983. This Louisiana cowboy started competing professionally in 1963. Although he never qualified for the National Finals Rodeo, he left his mark in Jackson, Miss., and won the 1979 all-around and tie-down roping championships in the Great Lakes Circuit Finals. Farrington ranked as high as 20th in the steer wrestling world standings in 1973. Cowboys have from Feb. 7-13 to top Farrington’s time and win their share of the Jackson prize money.